This is a listing for a 1inch pin button badge. 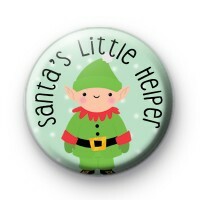 This is festive themed and has a cute Christmas Elf and 'Santa's Little Helper' in black text around the edge. Its a cute badge to pin to your coat or to give as a handmade stocking filler.